All summer long, Congress' frustration grew over the NFL's refusal to consider changing the name of the Washington Redskins football team to something less offensive to Native American populations. Then came a series of domestic violence and child abuse allegations against various players followed by the highly-criticized response, or lack thereof, by the league. Now, several senators stand poised to revoke or alter the league's special antitrust exemption and not-for-profit status in order to prompt what they see as much-needed changes. "It's open season on the NFL right now and it should be," said Gregg Easterbrook, the author of the forthcoming book, "The King of Sports," which examines the impact of football on America. The reason American politicians can have such an impact on the issue comes from two 1960s laws passed by Congress exempting the NFL from certain antitrust regulations and allowing the league to act as a monopoly when it comes to negotiating broadcasting rights. When the second law was being passed, lobbyists added "professional football leagues" to a list of not-for-profit groups in the Internal Revenue Code. The league (though not individual teams) has saved millions in tax obligations, Easterbrook told CBS News. NFL's Goodell pledges to "get it right"
Members of Congress from both parties now view this special treatment as a way to change the culture of the NFL, whether that's through changing the Redskins' name or forcing the implementation of harsher penalties for players who commit violent crimes. "Not only do we have control, we have a very serious obligation to avoid becoming complicit in NFL failures," Sen. Richard Blumenthal, D-Connecticut, told CBS News. "Our granting this very special exemption and other benefits to the NFL is in some ways a form of approval or condoning policies that have been abjectly inadequate." Blumenthal is planning to introduce a bill later this year that would revoke the permanent status of the antitrust exception and instead make it renewable every five years. A commission comprised of members of the sports world and other industries would create benchmarks and metrics for success in areas including health care, domestic violence and drug abuse that the league would have to meet in order to get the status renewed. He says that without the antitrust exemption in place, the league "would be nowhere near as lucrative as it is because it couldn't negotiate broadcast rights and other kinds of benefits in the same way." Since Congress has left town until after November's midterm elections, Blumenthal said the measure likely wouldn't be considered until a new Congress is sworn in next year. He told CBS News that his office is already in talks with the NFL about the proposal. Asked why he wouldn't just take away the antitrust status, Blumenthal said he believes that offering incentives "will have better results in the long run than simply removing the carrot completely." Easterbrook said that the antitrust exemption "is a huge hammer to hold over the NFL's head." He sees Blumenthal's proposal as "needlessly complex," though, and said Congress should use the threat of removing the status as a way to negotiate several agreements that shift some of the burden of paying for the NFL back from taxpayers onto the teams, such as forcing owners and the league to pick up the tab for new stadiums and operating existing ones. Last year, Easterbrook argued that the annualized value of NFL stadium subsidies and tax favors offered by states and local governments can add up to $1 billion. "What's really offensive is the public pays for facilities where the NFL copyrights the product and keeps the product," Easterbrook told CBS News. "Change that and you change the economics of all professional sports." Congressional outrage for now, however, seems focused not around the economics of the way the league does business, but rather the fact that Congress is subsidizing policies that have allowed players to get away with too much for too long. Dianne Feinstein: NFL violence "has gone on too long"
"What's happened is a dramatic growth in violence," Sen. Dianne Feinstein, D-Calif., said on CBS' "Face the Nation" Sunday. "There is no place for this, period." Feinstein and Sen. Kirsten Gillibrand, D-New York, were among 16 female senators who wrote to NFL Commissioner Roger Goodell earlier this month saying the league needs a "zero-tolerance" policy for players who commit acts of violence against women. In a "Face the Nation" interview last week, Gillibrand said that if the NFL "doesn't police themselves," Congress will look into the issue and possibly hold hearings on it. Other senators are taking aim at the tax-exempt status. Sens. Angus King, I-Maine, and Tom Coburn, R-Oklahoma, first proposed ending all pro sports leagues' not-for-profit designations because it was taking money away from American taxpayers. Republican Rep. Jason Chaffetz of Utah introduced a similar bill in the House. Senate Majority Leader Harry Reid, D-Nevada, joined fellow Democratic senators Maria Cantwell of Washington and Tim Johnson of South Dakota in introducing legislation that would strip the NFL's tax-exempt status if they continue to promote the Redskins' name. And Sen. Cory Booker, D-New Jersey, offered a bill last week that would revoke the NFL's tax-exempt status and use the revenue created by the move -- $100 million over 10 years, Booker says - to fund shelters, counseling and support for children who witness domestic violence as well as prevention efforts through state programs. 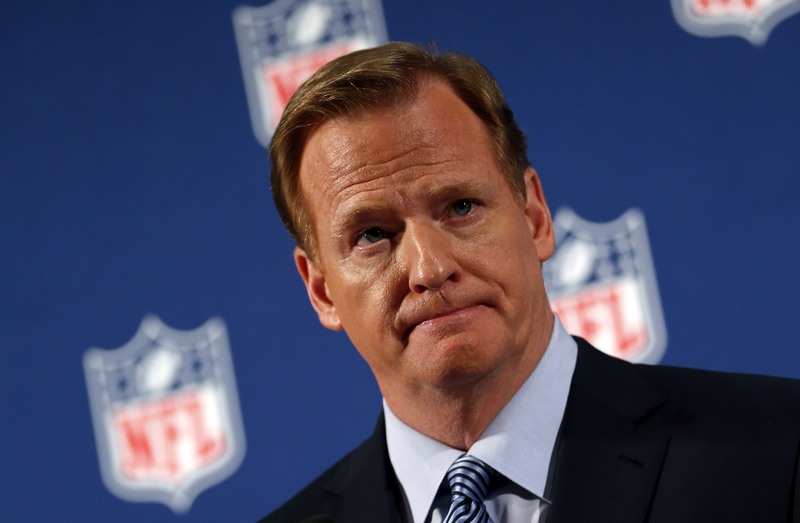 In a historical twist, Goodell's father, the late Charles Goodell, was a Republican member of the House and the Senate, representing New York from 1959 to 1971, the period during which Congress passed the laws benefitting the NFL. Easterbrook said the congressional appetite for tackling the NFL's problems are usually nonexistent - the last champion of the issue was the late Sen. Arlen Specter - and he expects that Congress will prompt some changes in the league. He is not, however, expecting any moves that will get at the NFL's economic structure and impact the current issues facing the league and its players. "The likely outcome of this turn of events is that sometime in the next month or two the NFL would make some kind of huge dramatic gesture....that has to do with symbolic politics in order to distract attention," he said.